One of the more common Tyrant Flycatchers in my area is the Western Wood-Pewee. I really struggle with identification of all the very similar flycatchers, but the I have learned well the call of the Western Wood-Pewee which is more reliable than my i.d. skills based on physical characteristics. 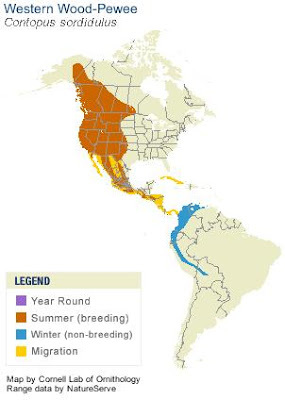 Wintering along the northern edge of South America, the Western Wood-Pewee makes its way up from the southwestern states in April and rapidly expanding its range in May along with most of the other migrants. The Western Wood-Pewee's range continues to expand into Canada and Alaska in June. By July and August sightings of Wood-Pewees becomes more concentrated and by September the range is shrinking. By October sightings are almost exclusively in the southwest. There is even a two-week period in December that has zero Western Wood-Pewee sightings recorded in North America and Mexico, so they really do get to South America for the winter. 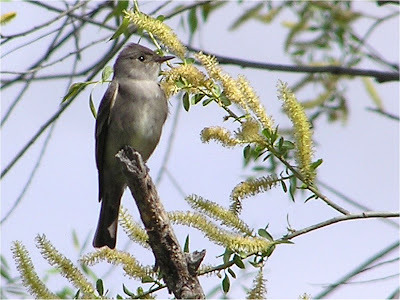 For more fascinating eBird data on the Western Wood-Pewee, click here!